I have another card to share with you today using the Lilly & Billy Winter Stamp Set from Pink Cat Studio. These lovely little angels remind me so much of the fun I used to have playing with my brothers in the snow doing the very same thing. I have used the same colour scheme as I did with yesterday's Lilly & Billy post...just because I don't like left over patterned paper. It always seems to go to the "I'll use it later pile" and it never gets used. So I do try quite hard to make two cards with each sheet of 12 by 12 patterned paper. Considering I do the inside of my cards the same as the outside 2 complete cards from one sheet is pretty good, I think anyway. Pink Cat Studio stamps are available on my website HERE! Well it has been more than a week since I posted a card, it's crazy how life can get so busy. I finally had a chance to use this lovely set from Pink Cat Studio called Lilly & Billy Winter Stamps. These stamps and many others from Pink Cat Studio are available on my website. 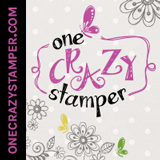 We offer at stamp club at www.onecrazystamper.com buy 10 stamps get your 11th one FREE. You can check out out on the front page of the website. Have a wonderful day & thanks so much for stopping by to see Lilly & Billy!